Lockable Notice Board with a blue felt back - ideal for use inside or outside. 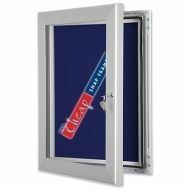 The door is hinged and lockable so ideal for security. This lovely blue notice board also features an internal rubber seal to keep the weather out. Available in eight different standard sizes. Delivery is a flat rate of only £10 + VAT to London and the UK mainland.